Began training in Kodenkan Danzan Ryu with Professor Pat Browne in Chicago Il. Became Sensei, Suburban Kodenkai Dojo (as a brown belt) from February 1999 to November 2001. Why as a Brown belt, there was no one else willing to do it after his sensei passed. He started it in a garage because he could not afford the space of his teacher. 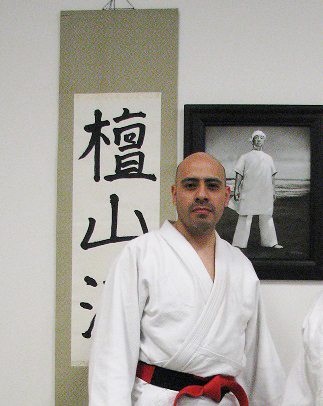 Sensei Gutierrez has been consistently involved with the AJJF. Beginning in November 1995. He has attended over 80 AJJF sanctioned events, to include special classes, seminars, regional and national events. He has been the recipient of the AJJF Okazaki Healing Arts Award. Not only does Filiberto have the largest dojo in AJJF, it’s a full time dojo with over 165 registered AJJF registrants. When he’s not teaching DZR he is helping others. Filiberto averages 30 Massage treatments a week. He is an amazing teacher, healer, practioner, and student of DZR.